Mountain Balm is a super-rich non-petroleum oil-based salve infused with healing herbs. Created to combat the arid, harsh conditions in the high altitudes of our Rocky Mountain West. Especially effective on wind-burned, sun-burned or extremely dry skin, irritated skin, skin rashes, eczema and insect bites. The healing properties of this vitamin-enriched balm are remarkable. 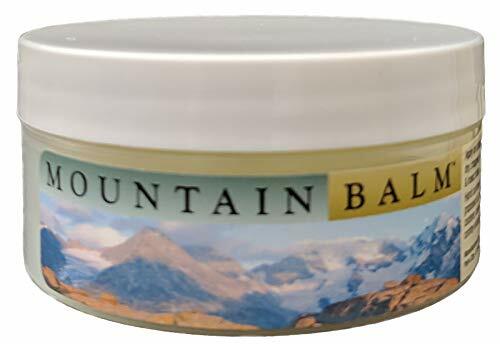 Great moisturizer for nails and cuticles during manicures and pedicures.Essential Oil Healing Balm made with All Natural Ingredients ✔️ Provides Instant and Lasting Relief For Severely Dry, Cracked, Itchy, or Irritated Skin! ✔️ Speed up healing time of any cut, scrape or bruise naturally! ✔️ SAFE, EFFECTIVE, and 100% NATURAL! Ingredients: Infused Hybrid Sunflower Seed Oil, Wheat Germ Oil, Grapeseed Oil, Olive Oil, Aloe Vera, Beta Carotene, Calendula, Yarrow, Red Clover, & Comfrey Extracts; Beeswx, Orange Peel Wax. Directions: Apply liberally to the affected area to speed healing and help prevent infection. Continued use is recommended for older wounds or scars. Sun Burn Balm, Chapped Lip Balm, Aloe Vera Balm & Wind Burn Balm from MountainBody.